I started throwing sidearm earlier than most, junior year in high school. Growing up in Connecticut, I was facing some very good hitters and was always looking for an advantage. I didn't throw hard enough so needed other tools. It became clear that multiple arm angles was an advantage in that it helped disrupt hitters timing and comfort level. Dropping down also helped create more angle vs. lefthanded hitters. I think it was just a lot more difficult for them to see the pitch and so they had a lot less time to recognize what the pitch was, and if it was a ball or a strike. There is no question that changing arm angles helped me get hitters out. Again, different looks to a hitter equals a tougher job on their part to square it up. I had lefty hitters tell me in spring training intersquad games that I should do it more often. Anytime you can cause a hitter to be uncomfortable you are winning the battle. Just try it, what do you have to lose. You may find some instant success and stay with it. I think athletes in general always need to evolve to stay ahead. An open mind is a good thing for a pitcher. I think sidearm is quite different than submarine. When throwing sidearm, for me, you aren't just necessarily dropping your arm to the side, but also tilting the upper half of your body down. So you keep some of the same mechanics as overhand. I had a fastball, curveball, forkball, and threw both fastball and curveball from the side. The curveball had more a flat plane to it, but to lefties looked like it was coming from first base! For righties I would pitch much more traditional, but use the two seamer sidearm to run it away from them. For lefties, the combination of a running two seamer in and a sweeping curveball away was often deadly. I think all hitters are afraid to get jammed, makes them look less manly or something, so the sidearm fastball to a hitter is so respected and often feared. Which of course opens up the other side of the plate for a pitcher. I just always felt confident throwing sidearm. Like I has this secret weapon at my disposal, and we all know how important it is to be confident. 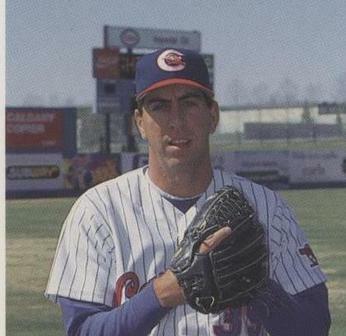 One last great story about changing arm angles: I was pitching in the Carolina league in 1990, and we had this big tall right-handed starter, who straight over the top, and threw very hard. However, he got pounded every time he pitched. It was puzzling, someone with such great stuff, getting hit so hard. But movement and deception are often more valuable than velocity. One day in August, down in the bullpen, the catcher asked him to throw a fastball sidearm, just for fun. It moved so much, and the angle his 6'6" frame created was scary. Well, he was basically unhittable the rest of that summer and beyond. That guy was Jeff Nelson, who went on to win 4 world series with the Yankees and pitch if a few all star games. That one pitch in the bullpen literally changed his life. Pretty cool.